Reached this screen, and crashes when X is pressed. The text looks a little funky, it either should be 2 lines, or is shifted to the right. Tested on [PC][V0.5]:: Now crashes upon creating new save data. 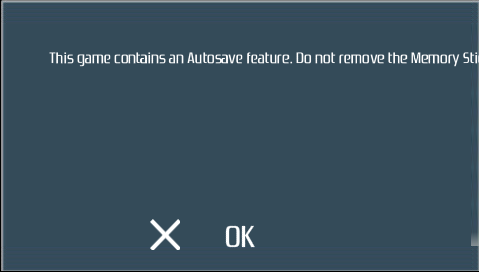 the game starts, but can not save the game when needed. When I press the buttons - pops "there is no data". Now works in v0.6-154-g966ded6 android version. Maybe at full speed on Nexus 7. Tested on v0.7-53-g79823fa, game is fully playable (Aside from audio, of course). One small bug though, when scrolling some portions of the screen begin shifting out of place. This makes the game much harder to play, as you can be standing on a block, but it appears you are standing in thin air. Aside from that, the game runs perfectly! Crashes when "now loading" now on android. i try to report it on Github. It works fine FINALLY on compiling build released today for PC. Good job. Test this game (Rev. 805)..
Mega Man Maverick Hunter X have same problem.